I don’t claim to know very much. The few things I do, sleeplessness, thirst, and unfolding to the wild of your own skin. And cookies. I claim to know cookies. They’re the vice that’s forever served me best. Of all the variations that frequent this space, this rendition is by far my favourite. Filled with rich pools of bitter dark chocolate, molten chunks of vanilla bean-studded halvah, deep burnt butter undertones, toasted walnut flecks, and slight hints of salt, they’re heavenly. A little richer than the usual, but all the more delicious. Here, the butter is melted down until it reaches burnt perfection and then re-chilled to form a consistency ideal for beating, and then re-weighed. It’s important to make sure that it has a malleable, soft, and supple feel to it, similar to that of room temperature butter, before use. It usually takes a total of 30 minutes chilling time to reach this stage but it all depends on your refrigerator and its temperature. It’s best to check on the butter every so often, giving it a gentle stir, as time goes on. You could also burn off the butter a few days in advance, re-chill it until solid, then let it come to room temperature the day of making. Halvah can be sourced in a variety of different flavors but I prefer to use plain or vanilla bean halvah in this recipe. The more neutral the halvah, the more the other flavors within the cookie will compliment and shine. In saying that though, there have been times when all I’ve had on hand was chocolate halvah, and on one occasion, coffee halvah, and both have worked out well. So whilst I recommend something neutral, the beauty of this recipe is that it's open to your experimentation and personal preference. 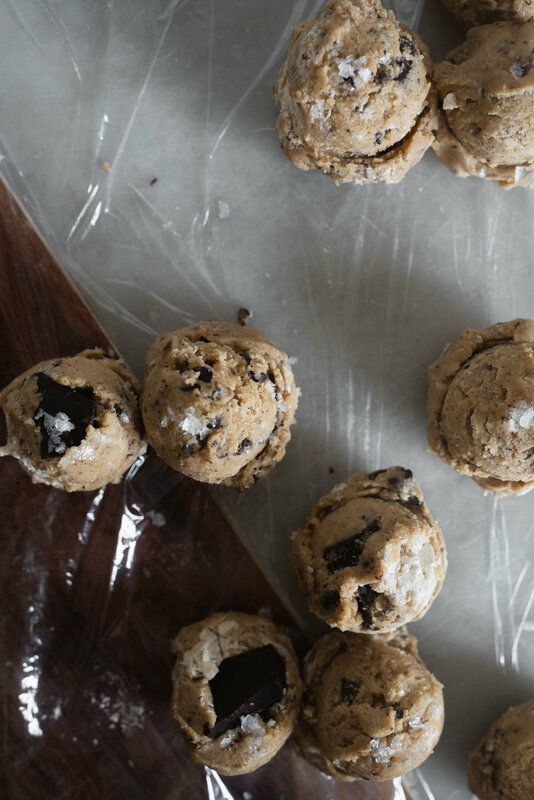 These cookies are perfect for times of craving. You can easily keep the dough balls sealed and stashed in the freezer for a few months and bake them off in moments of sweet whim and weakness. That’s hot cookies in a matter of minutes, no action time required. Begin by making the burnt butter. Place 150 g’s of the butter into a medium saucepan set over medium heat. Set the remainder of the butter aside. Heat, stirring often, until the butter is golden and melted. Increase the heat to medium-high and continue to cook, swirling the pan often but not stirring, until the butter is beginning to turn amber in color and nutty in fragrance. The butter will begin to foam but will subside as it continues to cook. Some burnt solids should have formed at the base of the saucepan. Remove from the heat and pour the butter into a bowl or pouring jug. Set it in the refrigerator to set until malleable and soft, similar in texture to room temperature butter, about half an hour. Make sure to give it a gentle stir every so often. Once set, remove the burnt butter from the refrigerator and re-weigh it. Add the remainder of the plain butter set aside above. Re-weigh to reach a combined total of 225 g’s. You may need to add a little more plain butter depending on how much evaporated during the burning process. Set the butter into the bowl of a stand mixer fitted with the beater attachment and add the light brown sugar and granulated sugar. Beat, on medium speed, until light and fluffy, about 5 minutes. Pause mixing to scrape down the bottom and sides of the bowl. Add in the egg and beat well until incorporated. Add in the vanilla bean extract and beat for a further minute. The dough should be considerably lighter in color and more aerated. Meanwhile, whisk together the flour, soda, powder, and salt, in a medium-sized mixing bowl until combined. Set the mixer speed to medium-low. Add in half of the dry ingredients. Beat until just combined, some floury pockets should remain, then add in the remainder of the dry ingredients. Again, beat until just combined. Add in the dark chocolate and walnuts and beat until evenly distributed throughout the dough, about 15 more seconds. Remove the bowl from the stand mixer and use a large wooden spoon to carefully fold in the halvah chunks. Take care with this step. You want the halvah to remain intact and not disintegrate within the dough - so be gentle with your folding. Cover the bowl with a layer of plastic wrap and set it in the refrigerator to chill until just firm, about 30 minutes. Meanwhile, pre-heat the oven to 180 Celsius. Set an oven rack in the middle of the oven and line three large baking sheets with non-stick parchment paper. When just firm, remove the chilled dough from the refrigerator. Using a small cookie scoop (1” or 2.5 cm in diameter) or a generous tablespoon as a measure, scoop out as many dough balls as possible from the dough. Divide them evenly between the sheets, making sure to allow room for spreading, and sprinkle over a little flaked salt over their tops. You should be able to fit 8 balls per sheet. If you have some dough balls left over, either set them in the refrigerator to chill whilst the other cookies bake, or seal and store them in the freezer, to bake off another time. Bake for 10-12 minutes. Three quarters of the way into baking, about 8 minutes, open the oven door and raise the cookie sheet by a few inches. The cookies should just be beginning to puff in the middle. Use a little force to tap the sheet against the oven rack, so that the cookies deflate slightly. You should see the chocolate begin to spread. Close the oven door and let the cookies bake and inflate again for a further minute to a minute and a half. Repeat this raise and tap process for a total of 3 more times. The cookies when done should be golden, crisp around the edges, and the middles just set with chocolate puddles throughout. Remove from the oven and allow them to cool on their sheet for 5 minutes, before carefully transferring them to a wire rack to cool further before serving warm or at room temperature.